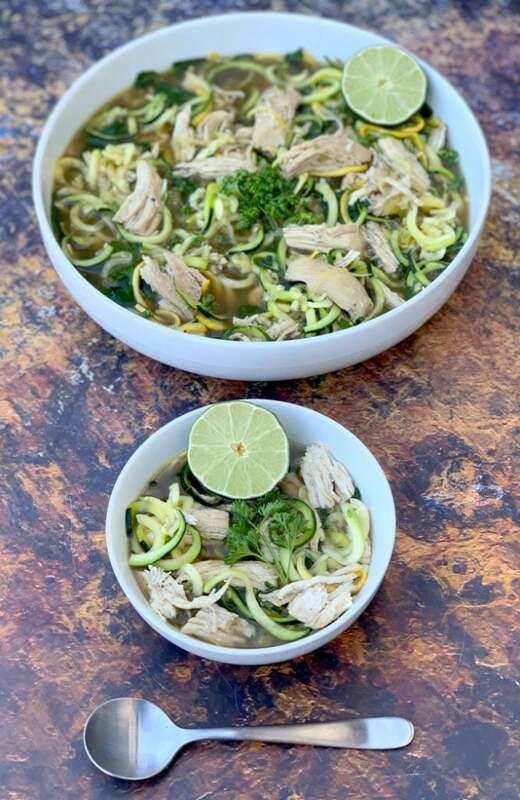 Keto Low-Carb Instant Pot Chicken Noodle (Zoodle) Soup is the best, healthy, no noodles soup that is made with zucchini. This homemade recipe can also be prepared in a Crockpot slow cooker and is made with bone broth, fresh veggies, and without rice. There are 7 net carbs in this soup. 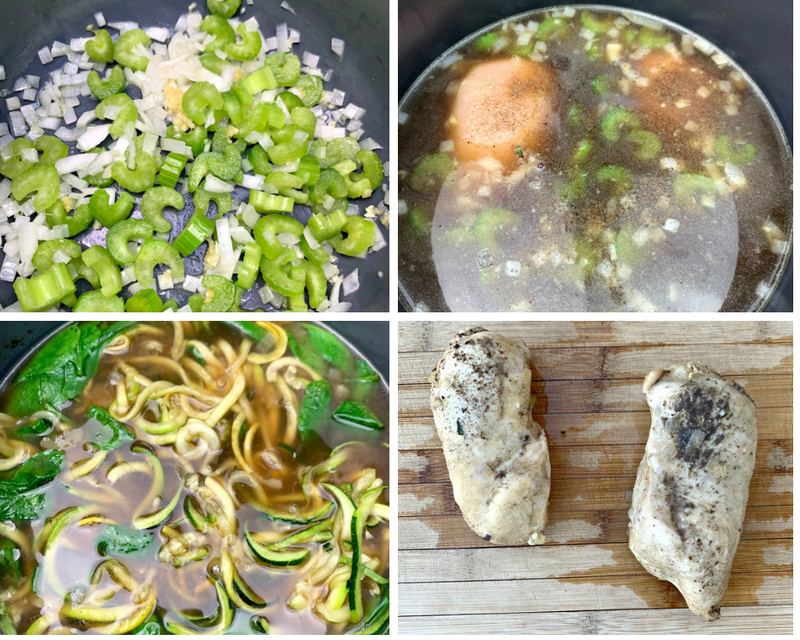 This post also outlines what soups you can eat on keto. Winter hasn’t been shy at all with alerting us of its presence this year. Here in Kansas City, we’ve had one snowstorm, a couple of ice storms and a lot of freezing cold temperatures. Warm soup recipes are a must! This one is loaded with nutrient-rich bone broth. It may help you fight off the winter colds and flu, too! 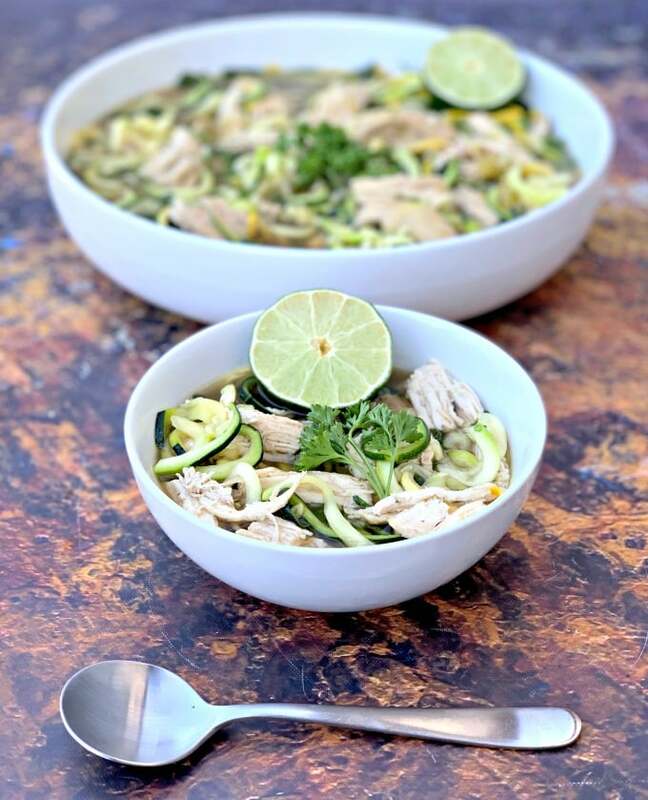 How Do You Make Keto Chicken Noodle Soup in an Instant Pot or Pressure Cooker? Saute onions, garlic and celery in the Instant Pot with the pot on the saute function. Add in the broth, Better Than Bouillon, and chicken breasts. Cook on Manual > High Pressure Cooking for 10 minutes. Allow the steam to release naturally for 10 minutes, instead of a quick release. Shred the chicken. 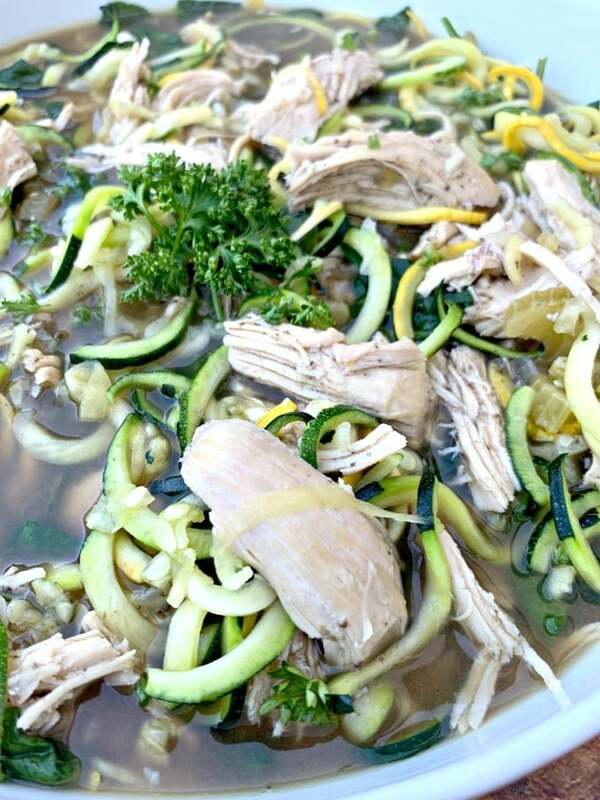 Add the chicken back to the pot with spiralized zucchini. 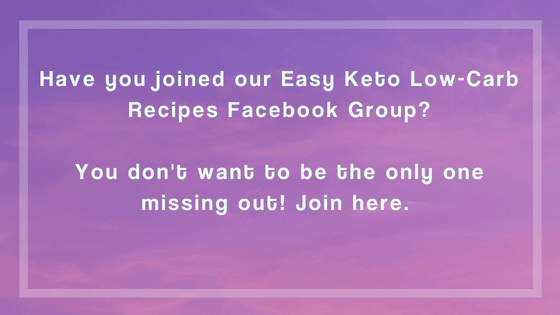 Can You Eat Chicken Broth on Keto? 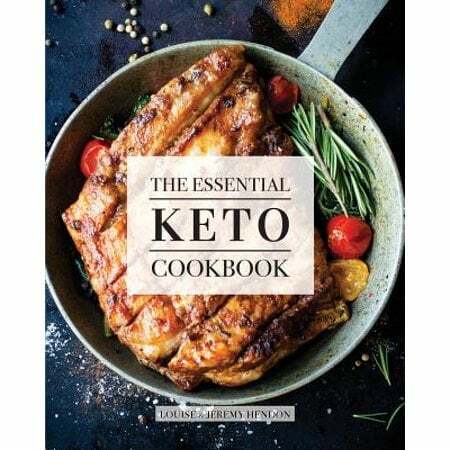 Yes, chicken broth is great for keto because it is low in calories and carbs. Bone broth is my preferred broth to use. 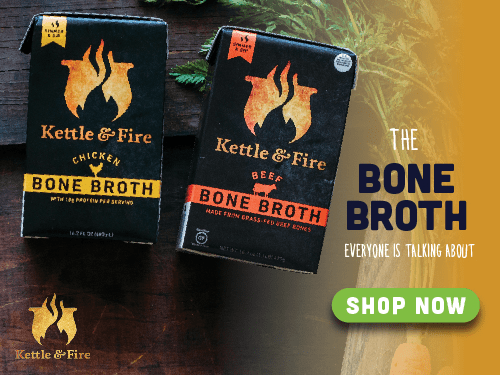 I love to use Kettle and Fire Bone Broth because it is loaded with so much flavor and you can have it delivered to your home. Use my discount code STAYSNATCHED to save. 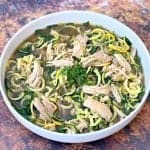 What Soups Can You Eat on Keto? What Soups Are Low Carb? My Keto Instant Pot Broccoli Cheddar Soup recipe is one of my popular soup recipes! What Are the Benefits of Using Bone Broth in this Recipe? Bone broth is nutritious, rich in vitamins, and nutrients. It’s made up of the broth that forms when cow, chicken, or fish bones are simmered. 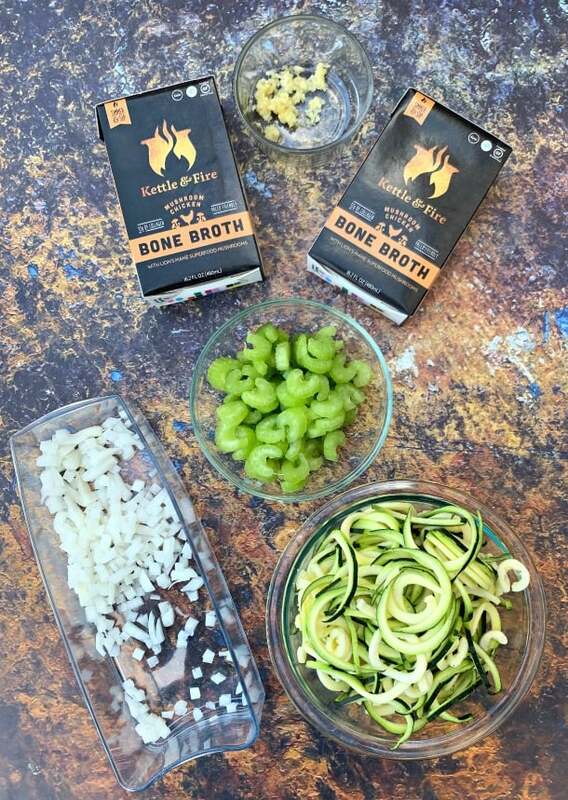 The broth is loaded with collagen and is great for helping improve the joints, reduce inflammation and leaky gut, aide in sleep and help promote weight loss. You can read more about Bone Broth Benefits here. 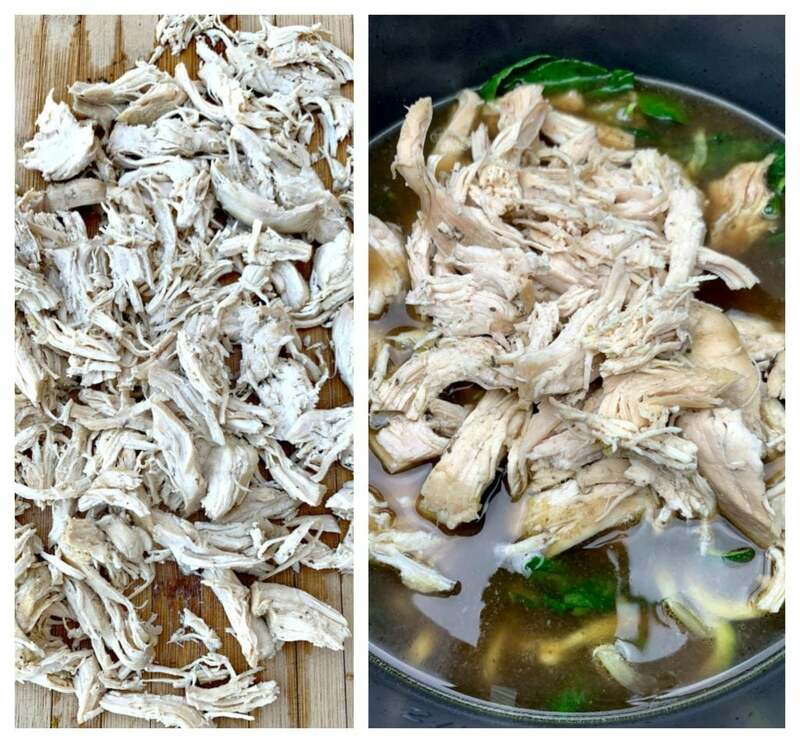 If you are interested in making your own bone broth, check out this Instant Pot Bone Broth recipe. What Is the Soup Setting on The Instant Pot? The soup setting on the Instant Pot is used for soups that require 20-40 minutes of cook time. On most models you can also adjust the setting to High or Low. How Long Do I Cook Soup in the Instant Pot? This soup will need 10 minutes to cook with an additional 10 minutes required to naturally release the steam. 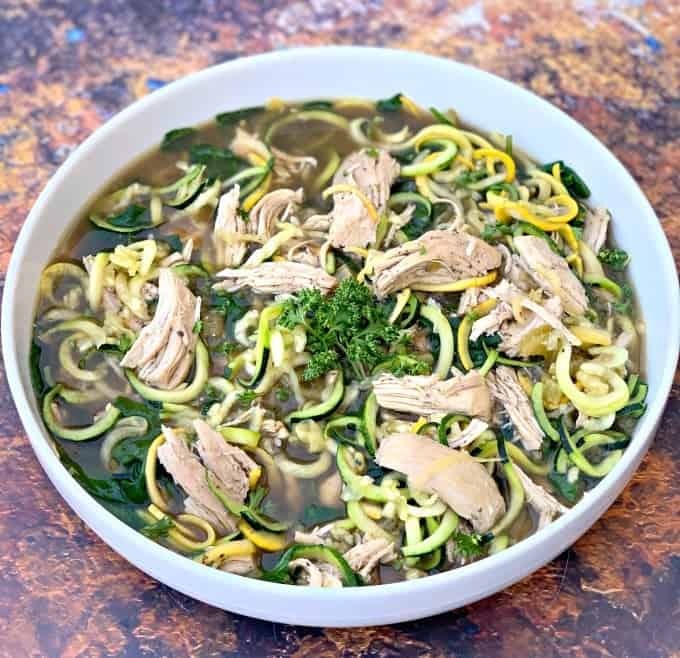 Is Keto Chicken Zoodle Soup Freezer Friendly? This soup freezes well. To defrost, allow the soup to thaw in the fridge overnight, as opposed to heating from frozen. 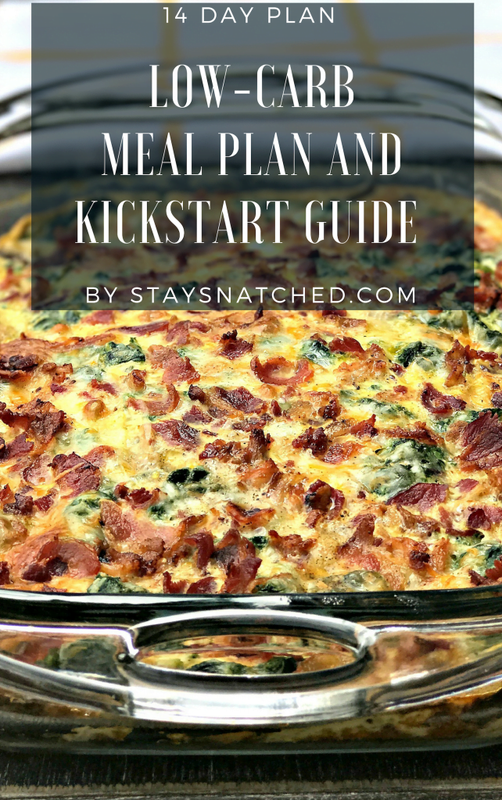 You may also enjoy my Keto Bacon Cheeseburger Casserole and Instant Pot Tuscan Chicken Thighs recipes. Here is the Kettle and Fire Chicken Bone Broth used in this recipe. 6 cups Kettle and Fire Chicken Bone Broth I used 2 packages of the Chicken Mushroom Flavor. You can also use chicken stock. 1 1/2 pounds spiralized zucchini, The amount of zucchini will vary based on size. This is about 3-4 zucchini. Turn the Instant Pot on the Saute function. Add the olive oil to the pot. When the pot becomes warm, add the garlic, celery, and onions. Cook until the onions are soft and fragrant. Add the bone broth, Better Than Bouillon, water, and chicken breasts to the pot. Place the lid on the pot and seal. Cook for 10 minutes on Manual High Pressure. Place the Instant Pot on the Saute function. Add the zucchini noodles and fresh spinach to the pot. Stir to combine. Allow the soup to cook until the noodles soften. Shred the chicken. Add the shredded chicken to the pot. Taste the soup repeatedly and add salt and pepper to taste. Heat a skillet on medium-high heat. Add the olive oil, chopped onions, celery, and garlic. Cook until the onions are soft and fragrant. Add the cooked vegetables, bone broth, Better than Bouillon, water, and chicken breasts to the slow cooker. Open the pot and remove the chicken and shred it. Place the slow cooker on Warm. 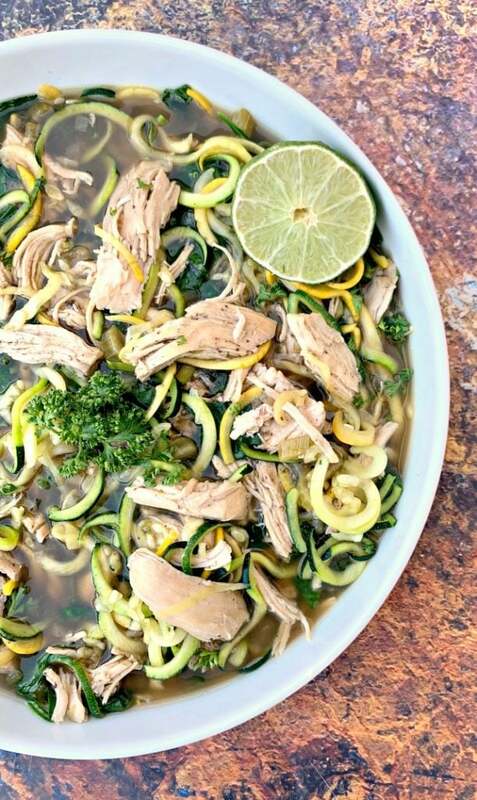 Add the shredded chicken, zucchini noodles, and spinach to the pot. Salt and pepper to taste. Cook until the zucchini noodles are soft. If you use chicken thighs, adjust the Instant Pot cook time to 14 minutes. Slow cooker time will remain the same.